(Run 4/17/15) This route starts again at the World Trade PATH station and heads east to City Hall, then north (left) on Lafayette. Lafayette heads north and merges into Park Ave around 9th St.
You’ll need to make a hitch around Grand Central Terminal, but you can rejoin Park Ave on 45th St via the pedestrian tunnel. 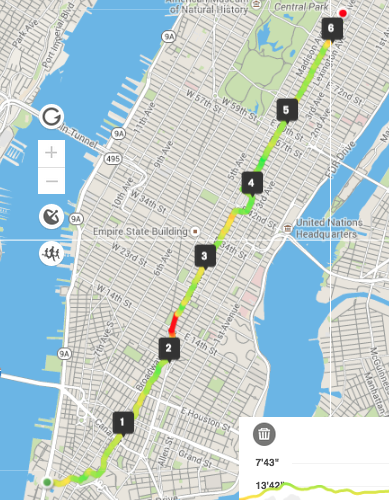 Continue up Park Ave to 86th for a 6 mile run or you can adjust to a 5 mile run by stopping at around 64th; stop around Grand Central Terminal (not “Station”) for a 4 miler. The route is almost verbatim the same route used during the annual Summer Streets event held every August. Basically, the city closes down Park Ave/Lafayette to automobile traffic for three Saturday mornings every August so everyone can enjoy walking, running, biking, or skating up and down Park Ave. Street fairs are also added for good measure. The GPS elevation map indicates that there were 6 significant hills during this run, however, the run felt like one long pull uphill. 6 hills for a ratio of 0.97. Here’s the New York I know and love. However, this is probably not the healthiest of routes for the runner. I’ve been thinking of a way to make this a more understandable stat. Think of it this way – if your high school coach asked you to run 6 miles and to inhale secondhand smoke 2.43 times per mile, would you question his training techniques? Right. This route should be safe until late at night. I’d say 11pm to 12am is reasonable for most runners. Yes. You’ll head through three of the busiest areas in the City. Sidewalk for the most part. If you need to freshen up for an evening out with friends, you can always stop by JackRabbits on Lexington between 85th and 84th Sts. This is my favorite part of this run. You see a pretty diverse swath of Manhattan via this route. And finally the Upper East Side which, along Park Ave, is sort of like the suburbs for the 1%. Here you’ll see very wealthy people walking very pampered dogs and interacting with the doormen of their buildings. Workable for 2-3 at the most. I had a few near misses as a single runner and moving at a pokey 10:30/mile pace. Not at all. Don’t fall asleep on this run and for goodness sake, don’t use headphones. Keep all those senses sharp. Like I said, lots of people and lots of intersections including major cross roads at Canal, Houston, Houston, 14th, 23rd, 34th, 42nd, 57th, 59th, 72nd, and 79th.